The presence of this content does not suggest an endorsement of this program by the Dr. Oz Show. This article contains a description of the history of binaural beats, brainwave entrainment, peer-reviewed research, pilot studies, and access to free binaural beats. The principle of entrainment describes the tendency for vibrating, oscillating, or pulsating objects to synchronize their pulsations when exposed to eachother's stimulus. The effect was first observed by Christian Huygens in the year 1666, when he observed that two clocks, which were ticking in proximity to eachother, tended to eventually settle on the same tick-tock pattern without any human intervention. However, he also observed that the clocks would begin ticking in 'anti-phase', where the pendulum swings occurred at equal intervals but in opposite directions. Therefore, they had the opposite "phase" but the same "period". Therefore, the subtle vibrations that were transmitted from one region of the wall to another caused the clocks to begin ticking in synchrony or asynchrony with eachother. This effect was later discovered within biological systems, where the presence of a periodic stimulus could influence a vast range of physiological and psychological patterns such as brainwaves. The field of chronobiology describes the tendency for biological systems to 'entrain' to the rhythmic patterns of the stimuli to which they are exposed. One of the simplest examples is the circadian rhythm, which follows the periodic rotation of the earth on it's axis in relation to the sun. For most animals, wakefulness occurs during daylight and sleep onset occurs during twilight. Meanwhile, other animals are nocturnal and so have opposite sleep cycles, but they are also entrained by the rotation of the earth on it's axis. Through listening to a pulsing stimulus (such as a rhythmic drum), brainwaves tend to be 'driven' or 'entrained' to the frequency of the drum. This is referred to as the Frequency Following Response, and the entrainment of brainwaves is typically referred to as 'Brainwave Entrainment'. Yes - Brainwaves may be 'entrained' through the Frequency Following Response, but visual stimulation appears to be the most effective. Heinrich Wilhelm Dove discovered the binaural beat phenomenon in 1839, where he observed that when individuals were exposed to two steady tones (one in the left ear and one in the right), which were of slightly differing frequency (i.e. 100hz and 90hz), the brain combined the two tones and perceived a vibrato of the difference (i.e. 100hz - 90z = 10hz perceived pulsation). Dove discovered this through placing a subject in a room and placing two Tuning Forks on opposite sides of the room - These instruments were precisely tuned to produce a specific steady frequency, but subjects perceived a "vibrato" internally. Thus, binaural beats were discovered. The binaural beat effect was not explored for nearly a century until Dr. Gerald Oster's neurological research revealed that some individuals could perceive binaural beats, but others could not - This was indicative of certain neurological conditions. Dr. Oster described his discovery in a publication entitled "Auditory Beats in the Brain". Oster explained that the best carrier wave for binaural beats was approximately 440hz, and anything beyond 900hz or below 90hz was likely to be inaudible to humans. Oster estimated that the approximate auditory intensity of the internally perceived binaural beat was near 3 decibels, and most subjects could detect the presence of a binaural beat within 3-seconds of exposure. He was also surprised when he noted that when beats are produced very infrequently, fewer than "about three per second", the listener perceives the beat to move "back and forth" in their head. Furthermore, if the volume of each tone is different, the interior perception of the beats take an apparently "elliptical" path within the head. The Monroe Institute was established by Robert Monroe, a former media executive who established the Jefferson Cable Corporation. This was the first ever cable company to provide complete coverage to the state of Virginia, and he was involved in many other forms of mass media broadcast. Monroe began to experience states of expanded self-awareness, and he believed that he could utilize binaural beats as a means by which to guide others through a similar experience. His 'Gateway' program utilized binaural beats in order to induce a trance-like state, which was accompanied by verbal instructions (i.e. a guided meditation) on how to replicate the states he believed that he had experienced. Focus 1: Standard, waking state awareness. Focus 10: The physical body is deeply relaxed, in a state of 'Sleep Paralysis', but the mind is awake and alert. Focus 11: The 'Access Channel' to multiple various states of physical, mental, and emotional awareness. Focus 12: Expanded awareness during the 'Sleep Paralysis' state. Focus 15: Timeless awareness, where the standard constraints of linear time are not relevant to information processing. Focus 21: Sense of Timelessness + Increased sense of Spatial awareness. 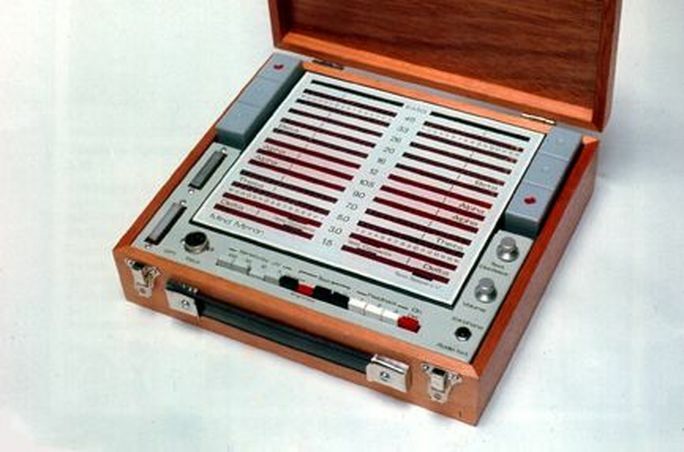 These 'Levels' served as the core binaural beat audio program provided by The Monroe Institute for many years. There are several other levels through "Focus 49", which we have omitted these for brevity, as they are more concerned with metaphysical claims, which are best described by those who subscribe to that belief system. Their "Hemi Sync" binaural program also included a wide variety of alternative audio products designed to promote self-awareness, creativity, flow states, and many others. Bill Harris, of the Centerpointe Research Institute is one of the most successful binaural beat audio program sales leaders, and his program is probably the most well known. In fact, 'Holosync' is known to be one of the leading brainwave entrainment programs and the "original", but The Monroe Institute would dispute that and claim that they are in fact are the originators of the technology. However, this section is not designed to determine who was the originator but rather, to focus upon the unique characteristics of each brainwave entrainment audio program. Are these multiple levels required to progress in one's binaural beat training practice? Perhaps and perhaps not - There are no double blind clinical studies on the comparable benefits of progressing from Level 1 to Level 12 vs. simply utilizing Level 1 for the same period of time. Therefore, we recommend that a study is completed in order to determine the presence or absence of a therapeutic effect. Holosync is predicated upon the principle of "Carrier Waves" that are designed to change from Level 1 - 12 in order to "challenge" the brain to adapt. For example, Level 1 is presented as providing a "low challenge level" for the brain, and each successive level is purported to provide a "higher challenge level". However, the nearest known psychological effect that we could suggest this makes use of is through addressing the problem of "habituation" to stimulus (i.e. the tendency for the brain to adapt to a stimulus and cease responding). Hence, when you listen to background sound buzzing from your computer's fan, your brain "habituates" to the stimulus and eventually you do not notice the sound. The brain stops responding and 'ignores' the audio data - Until the background sound suddenly changes (i.e. becomes softer or louder). Hence, through changing the "Carrier Wave", perhaps Holosync "refreshes" the brain through a novel auditory stimulus, which causes it's auditory neurons to respond once more, delivering the intended brainwave entrainment stimulus. Further research is required on this subject. 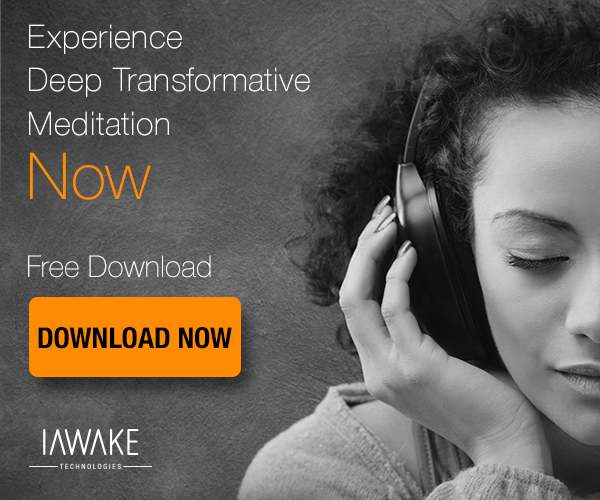 A separate company, iAwake Technologies, was developed in order provide simplified binaural beats for brainwave entrainment , which utilized variable carrier waves within a single 1-hour session rather than spread over 12 multi-hour sessions. Perhaps this serves to ensure that the habituation effect is addressed more rapidly - Within a single track. Through varying the binaural beat's carrier wave from high to low within one session, the company believed their technology would serve as a more cost-effective and efficacious binaural program. This, of course, must also be addressed through a controlled clinical trial in order to determine whether their company's use of carrier waves are more effective or comparable to that of Holosync or placebo. The company also implemented a unique a form of '3-D sound' stimulation, which most of the other binaural beat producers have also implemented for their own programs. Rather than simply embedding binaural beats within a relaxing soundscape such as birds chirping, bells, and windchimes, the company sought to cause the Left and Right channels of the entire soundscape to vary in wavelength so as to produce a more immersive entrainment effect. The company also incorporated a form of auditory bilateral stimulation, which is more commonly referred to as 'Eye Movement Desensitization and Reprocessing' (EMDR). The original form of EMDR was developed by psychologist Francine Shapiro in order to more rapidly promote the processing and release of psychological trauma when compared with psychodynamic therapy alone. The original method required that subjects follow a pendulum-like object with their eyes, which would cause them to gently look Left and Right, back-and-forth throughout an EMDR session. Presumably, performing this task while recollecting a painful memory could cause a physiological change in the brain that would promote the release of the painful memories. This methodology was eventually expanded to include all forms of bi-lateral stimulation, which included holding 2 hand-held devices that vibrated in alternation, first Left, then Right, and so on. Meanwhile, auditory bilateral stimulation was also developed as in which to administer EMDR, where a single tone would discontinuously alternate 'On' and 'Off' within the Left and Right ears. The company included this with it's 'Integrated Neural Entrainment Technology' as a means to promote the release of any psychological trauma that could emerge during theta binaural beat brainwave entrainment. The reason for this is that some believe theta brainwave states to be correlated with the revelation of latent psychological content and traumatic memories, so the release of this content may be of benefit. The following data included a basic pre and post- binaural beat stimulation session (6 - 12min) with a Delta brainwave binaural beat audio program developed by iAwake Technologies. Red = High amplitude for brainwave category (Excessive amplitude). Green = 'Correct' brainwave amplitude according to Z-score database. Blue = Low amplitude for brainwave category (Deficient). The below data suggests changes in brainwaves occurred during the observation. Summary View: Alpha waves and Beta waves decreased as 'Delta' stimulation was administered. Brainwaves began to slow. Summary View: The presence of Delta and Theta waves appear to have increased significantly, while Alpha and Beta waves have decreased (Below). Disclaimer: This was not controlled, blinded, or randomized study, so placebo or simple sitting could have resulted in the below EEG changes. The below video contains an example of the physics of entrainment unfolding, which has been subsequently applied toward human brainwave stimulation through binaural beat audio technology. The appearance of NIH material does not represent an endorsement of this technology by the NIH. The statements on this website have not been reviewed by the FDA and are not intended to diagnose or treat disease. The Journal of Alternative and Complementary Medicine published a study entitled “Binaural Beat Technology in Humans: A Pilot Study to Assess Psychologic and Physiologic Effects”, which was published by Helane Wabeh, ND, Carlo Calabrese, ND, and Heather Zwickey, PhD, of the Helfgott Research Institute, National Colleg of Natural Medicine in Portland, OR. The researchers sought to describe binaural beat audio MP3 technologies, which are widely available for free and in paid form, as a personal development and general wellness tool designed to promote relaxation. Their pilot study on binaural beats consisted of 8 participants listening to binaural beats daily for a period of 60-days. The binaural beats were primarily focused upon inducing a delta frequency in the auditory cortex at 0-4hz, and the researchers were interested in studying Depression through utilizing the Beck Depression Inventory-3, the State-Trait Anxiety Inventory, Profile of Mood States, Tellegen Absorption Scale, and World Health Organization-Quality of Life Inventory. Moreover, the researchers sought to study the psychological effects of binaural beats through measuring a variety of blood and neurotransmitter factors. The researchers observed a decrease in trait anxiety, increase in quality of life, and a decrease in insulin-like growth growth factor-1, and dopamine (p=0.004, p=0.03, p=0.01, and p=0.02, respectively). Limitations: This was an uncontrolled, non-blinded pilot study on binaural beat meditation audio technology, so the effects could have been a result of simply sitting quietly or placebo. Australian researchers presented their preliminary research on the subject of binaural beat audio and visual stimulation (photic stimulation) at the Australian Biomedical Engineering Proceeding 412 in the year 2004. D. Cvetkovic, D. Djuwari, and I. Cosic presented findings, which they suggested may provide preliminary evidence for an entrainment effect on EEG (Electroencephalographic) activity. The effect was observed when binaural beats, photic stimulation, and extremely low frequency (ELF) electromagnetic field stimulation was applied to subjects. Limitations: The abstract provided limited data on the experimental design, so the researchers should be contacted directly if readers are interested in more information. 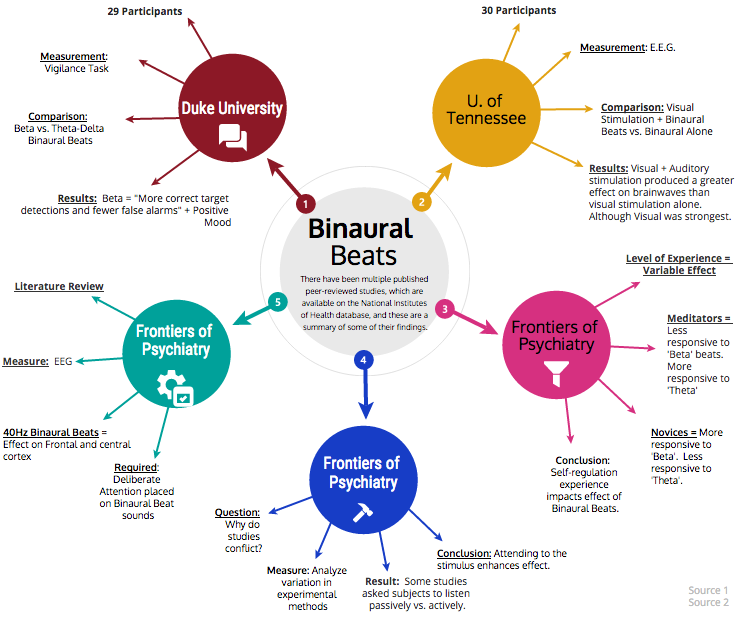 Researchers from the Departments of Psychiatry and Behavioral Sciences at Duke University Medical Center published a study entitled "Binaural Auditory Beats Affect Vigilance". The researchers began through simply describing the nature of binaural beats, which we have previously discussed in this article, and they proceeded with explaining their experimental design. The researchers were primarily interested in comparing the effect of binaural beats on Beta EEG and Theta/Delta frequency ranges on both mood and vigilance tasks. The 29 participants were asked to complete a 30-min vigilance task over a period of 3-days while listening to either Pink Noise, Beta frequency binaural beats, or Theta frequency binaurals. The participants were blinded to the anticipated effect of binaural beats as well as which auditory stimuli contained the stimulus. The researchers found that subjects performed more effectively on vigilance tasks when listening to Beta range binaural beats in comparison with the presence of Theta/Delta frequency binaurals. The researchers concluded that the technology may serve to promote vigilance and regulate psychomotor activity and mood. Limitations: This study was single blinded, but users could theoretically detect the presence or absence of binaural beats in the event that a subtle difference in the audio tracks was perceivable. Jon Alan Frederick's PhD was presented to and accepted by the University of Tennessee's Doctor of Philosophy program on the subject of audio and visual stimulation. 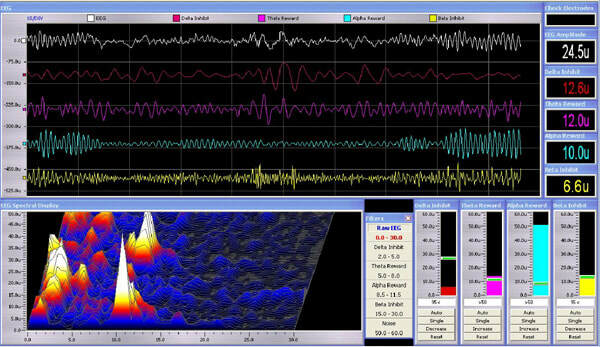 The dissertation was entitled "EEG Coherence and Amplitude Effects of Rhythmic Auditory and Visual Stimulation" and was published in December of 2001. Frederick conducted a study on 30 college students in which he sought to review their baseline EEG through an "eyes closed" observation of their brainwaves. 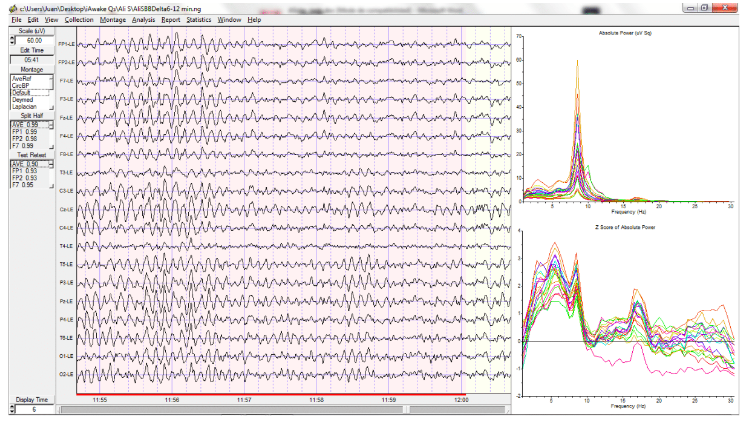 Next, he exposed each subject to 3 randomized 5-minute stimulation sessions while monitoring EEG. To separate each stimulation session and allow for the brain to return to it's baseline state, he required a 4-min eyes closed observation. Through these observations, he determined that Visual stimulation and combination Audio + Visual stimulation produced a significant increase in EEG amplitude for 8 - 12hz, 13 - 21hz, and 21-32hz. Although auditory stimulation alone produced limited effects on amplitude and coherence, combining Audio + Visual stimulation did, in fact, result in pronounced differences in comparison with the Visual stimulation alone. Therefore, an audio stimulation effect appears to have been present and synergistic with the visual stimulation. Review: Why Do Some Binaural Beat Studies Contradict? The scientific Journal, Frontiers of Psychiatry featured a publication by German researchers, where they explained their position that "auditory beat stimulation may be a promising new tool for the manipulation of cognitive processes and the modulation of mood states". The researchers conducted a literature review in which they determined that research on binaural beats and monaural beats have historically produced mixed and sometimes contradictory results. Through reviewing 920 articles that matched their general search parameters for binaural beats and cognition, memory, attention, mood vigilance, anxiety, creativity, and several related parameters, they selected 30 published articles for their review. The researchers believed it was important to describe not just the nature of binaural and monaural beats, but they also sought to elucidate the characteristics of the "Auditory Steady-State Response". This is defined as the tendency for rhythmic auditory stimuli to drive background brainwave activity as measured by EEG (i.e. Brainwave entrainment). Their review explained that differing instructions provided to subjects during auditory stimulation may have resulted in varying effects of the stimuli. For example, Tiitinen et al observed that a 40hz response was primarily evoked over the frontal and central cortex when subjects were asked to deliberately attend to the auditory stimulus, but the effect was reduced when they were instructed to ignore the stimulus. This may suggest that deliberate engagement with binaural beats is required in order to achieve an optimal effect, whereas passive listening may produce a far reduced impact. To further provide evidence for this theory, the researchers examined another study by Ross et al in which researchers observed subjects through Magnetoenceophalagraphy (MEG) and instructed them to attend to the stimulus. The impact upon brainwaves was also enhanced through deliberately attending to the beats. Meanwhile, yet another study by Muller et al also demonstrated this effect with 20Hz auditory beats but not with 45hz. These three studies, when combined, suggest a potential reason that studies on binaural beats and their impact upon brainwaves may be mixed. That is - The experimental methods appear to vary, and the critical differentiating factor may be whether subjects are asked to attend to the binaural beat stimulus vs. listen passively or engage in a task. The researchers also addressed a study published by Lavellee et al in which binaural beat stimulation at the theta frequency (7hz) resulted in an increase in left temporal lobe delta power for subjects who were experienced with meditation, whereas this effect was not observed in novices. However, the novices were more responsive to beta binaural beat stimulation, while the experienced meditators were less responsive to this frequency. Therefore, the effect of binaural beats upon brain activity appears to be related to the degree to which subjects have experience with self-regulating their state. (The article link contains more information on binaural beats, which have not been fully addressed on this current page). Those who are interested in binaural beats are typically interested in their applications for brainwave entrainment. The human brain contains trillions of nerve cells, which pulse at a variety of fairly regular frequencies in order to transmit signals from one region of cortex to another. These brainwnave states have been broadly defined as slow to fast waves (Delta, Theta, Alpha, Beta, and Gamma). 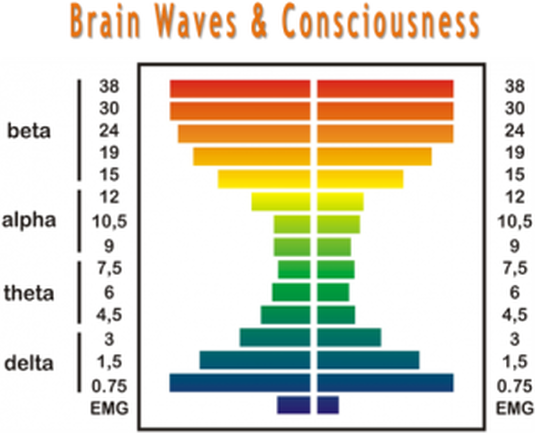 These brainwave states are believed to be correlated with a variety of psychological states such as sleep, meditation, waking consciousness, relaxed alertness, etc. Therefore, one must understand the role of brainwaves in relation to various states of awareness in order to understand the role of binaural beats and their potential applications for modulating brainwaves and influencing brainwave states. These brainwave states may be observed through an Electroencephalograph (EEG), which includes attaching electrical sensors to an individual's scalp and transmitting subtle electrical data produced by neurons, to a signal amplifier followed by a software interpreter for visual display of the data. These EEG systems may also be utilized for training individuals to 'self-regulate' their brainwave patterns through 'Neurofeedback'. Neurofeedback is also known as Electroencephalography Based Biofeedback (EEG-Biofeedback), because brainwave signals are 'body' or 'bio' signals that are monitored by a computer and 'fed back' to the user in the form of visual data or auditory signals that correspond with specific physiological events. This information may next be used to train the individual to self-regulate their brainwave activity: "Neurofeedback". The brainwave signals may be trained by Executives, Attorneys, Business Leaders, and Parents / Children in order to optimize their brainwave patterns. This may serve to maximize psychological stability, adaptability, executive attention, coherent focus, and many other traits. Many have looked to neurofeedback in conjunction with binaural beats for ADHD, Depression, and other psychological conditions, but the FDA has not approved this methodology to diagnose or treat disease. This FDA status also means that companies may not make claims regarding the efficacy of neurofeedback or binaural beats for diagnostic or treatment purposes. Therefore, individuals may use these systems for general wellness purposes. ​Gamma brainwaves are regarded as the fastest brainwaves, and some believe they correlated with binding together multiple regions of cortex. This "Gamma Binding" theory suggests that the brain must transmit information from one region of the brain to another rapidly in order to coordinate complex information processing, and many believe this is accomplished by the presence of Gamma. These brainwaves oscillate between 40 - 80hz, but they are very challenging to measure. The reason they are challenging to measure is because their very high frequency is similar to the electrical activity produced by muscle tension in the jaw and face. However, some EEG / neurofeedback systems claim to remove the muscle tension 'artifact' from the EEG / neurofeedback signal. Therefore, training gamma with some systems may indeed be feasible. Some believe that Gamma brainwaves may be increased in order to enhance a sense of clarity, focus, alertness, energy, and happiness. Research has provided evidence that increase Gamma brainwave activity in the left parietal pre-frontal cortex may be associated with increase compassion and it's consequent sensations of peace, love, happiness, and fulfillment (See: University of Wisconsin, Richard Davidson). Therefore, increasing Gamma brainwaves in these regions of the brain may be achieved through deliberately evoking sensations of love and compassion independently or in conjunction with free binaural beats or EEG / neurofeedback. Gamma brainwaves may therefore promote general wellbeing. Gamma brainwaves may also be associated with excessive stimulant consumption and overstimulation of the central nervous system. Therefore, individuals with excessive anxiety, aggression, or sensitivity to stimulus may prefer to suppress excessive Gamma brainwave activity through increasing Alpha and Theta brainwave states. These brainwave states are associated with self-awareness, relaxation, and general central nervous system balance. Therefore, rather than suppressing Gamma brainwaves directly, one may prefer to increase it's counterparts - The Alpha and Theta brainwaves. Those interested in free binaural beats may also want to learn about Beta brainwaves. Beta brainwaves are on the fast-end of the brainwave spectrum - The speed of Beta brainwaves is roughly 13 - 25 hz, and they are correlated with an awake, alert, problem-solving state. Stimulants such as caffeine may enhance Beta brainwaves. Binaural Beats or Neurofeedback may be an effective means by which to enhance alertness, energy, excitement, and engagement through increasing Beta brainwaves. Individuals with too much Delta, Theta, or Alpha brainwave activity during problem-solving states may experience challenges with executive attention, energy, and engagement. Therefore, increasing Beta brainwaves may also suppress Alpha, Theta, and Delta brainwaves. However, one must ensure that they have secured sufficient sleep and limit their stimulant intake prior to engaging in free binaural beat or neurofeedback training. The reason for this in neurofeedback training is that lifestyle choices that adversely impact sleep and waking cycles (such as sleep deprivation and excessive stimulant consumption). This may skew the EEG's baseline brainwave readings, which makes accurate training a challenge. Rather, one must sleep well 24-hours prior to neurofeedback or free binaural beat training and abstain from drugs and alcohol prior to visiting the training facility. Beta brainwaves may be too high for individuals who experience constant fear, apprehension, anxiety, or aggression. Excessive beta brainwave production may be reduced through increasing the production of Alpha brainwaves first, Theta brainwaves second, and Delta brainwaves third. However, the majority of time will be spent on simply increasing Alpha brainwaves, because these are only one step slower than beta brainwaves. Once Alpha brainwaves have been enhanced, and Beta brainwaves have generally slowed across multiple sessions, one may begin training Theta brainwaves. Otherwise, going straight for Theta brainwaves would be too challenging - Alpha is the 'Gatekeeper' for Theta brainwaves, so they must be trained first. Some may prefer to utilize free binaural beats, while others may prefer neurofeedback training. We Offer All of Them in One Easy Mental Training! The Peak BrainHappiness Trainer Pro offers easily understandable professional grade neurofeedback (brainwave biofeedback) for enhancing attention, memory, and happiness. The experience is very different from Lumosity or other "brain training" games. Neureka! training is much easier to do and leaves you feeling lots better. A unique combination of the BrainLink Pro hardware and our special version of BioExplorer training software with specialized methods. BrainLink has sold over 100,000 systems in China. It's well tested. It’s a very comfortable, lightweight headband that sends brainwaves via Bluetooth signals to your PC or Mac (with a Windows partition or Boot Camp). Is easy to learn to use, with a fast learning curve and Training Videos. You can start to understand and control the results in less than two minutes of training. Gets a great signal from simple dry sensors. Your mind triggers and controls the size, brightness, and volume of DVDs, videos, CDs and audio tracks. Pick your own to make training interesting. Is simple to use, so that youngsters can practically train themselves, and clinicians can train several clients at once. It’s ideal for group training or a clinician's home rental program, with special volume pricing. Those individuals who train with binaural beats or neurofeedback may also want to learn about Alpha brainwaves. These are correlated with a calm, relaxed, waking state, quiet listening, and alert attention. Alpha brainwaves oscillate at 8 - 12hz, or cycles per second. Clap your hands at 8 - 12 times per second, and you will get a sense of the speed of these brainwave patterns. Most likely, this is too fast to clap manually, but go ahead and experiment! Alpha brainwaves are correlated with increased self-awareness during a relaxed and attentive state. This may also be correlated with a 'Zen' meditative state, which is well balanced - Neither too sleepy or to alert and energized. Training these brainwave states may be valuable for individuals who find themselves to be too over-excited, anxious, or overstimulated. The most effective free binaural beat or neurofeedback training requires that individuals abstain from caffeine and other stimulants for 24-hours - Particularly prior to Alpha binaural beat or neurofeedback training, because artificially changing the brain's state through chemicals may counteract the effect of the training stimulus. Removing stimulants from the body provides a more accurate baseline from which to begin training. Some individuals may produce excessive Alpha brainwaves in parts of the brain that should produce Beta or Gamma waves. These fast brainwaves are responsible for transmitting information and integrating data from one part of the brain to another. Therefore, a deficiency in Gamma brainwaves and an excess of Alpha brainwaves may suggest that information is not effectively transmitted from one part of the brain to another. Therefore, one may engage in free binaural beat or neurofeedback training in order to enhance gamma-binding from one part of the brain to another - Transmitting data from the verbal centers to the physical speech centers of the brain in order to increase flow-states - For example. Theta waves are slightly faster than Delta waves, and they may be associated with a hypnogogic state (just prior to sleep), a meditative state, and intense imagery. Theta brainwaves oscillate at 4 - 8 hz, or cycles per second. Clap your hands together 4 times every second - No 8 times every second. As you can see, this is a much faster brainwave that Delta, which we discussed in the previous article. However, this is still regarded as a relatively slow brainwave in comparison to Alpha, Beta, and Gamma. Why Increase Theta Waves with Free Binaural Beats? Theta waves may be increased though free binaural beats, independent training, or neurofeedback in order to maximize contact with repressed emotions. Therefore, increasing theta waves through these means may enhance the efficacy of psychotherapy, which strives to contact suppressed emotional states. Theta binaural beats or neurofeedback may also enhance the degree to which one may access 'spiritual' or 'meditative' states, so theta binaural beats / neurofeedback may accelerate the acquisition of deep meditation related skills. Moreover, theta training may set the stage for deeper Delta brainwave training, because Theta waves must be increased prior to training Delta (This is a step on the stairway that descends toward predominantly slow brainwave states). Those individuals whose Theta brainwaves are produced in an excessive quantity during the day may find themselves feeling drowsy, much as with Delta waves. However, this may not be as severely drowsy as with excessive Delta. Regardless, excessive Theta brainwaves may also be corrected through ensuring that one's sleep cycles are completed daily, and excessive sedative intake is reduced. Some free binaural beats or neurofeedback may suppress theta brainwaves and bring them into a healthy range, just as with Delta brainwaves, and this may be accomplished through increasing Beta brainwaves. The reason for this is that Beta brainwaves are associated with alertness, problem-solving, and energy - Increasing these brainwaves naturally suppresses the slower, more relaxing Theta brainwaves. Therefore, free binaural beats or neurofeedback area may be effective for increasing or decreasing Theta brainwaves, depending upon the individual's needs. Free Binaural Beats and neurofeedback may be a potentially effective way in which to maximize brain performance across multiple brainwave patterns. What is a Delta Wave? The first pattern that must be reviewed is the slowest brainwave - Delta. 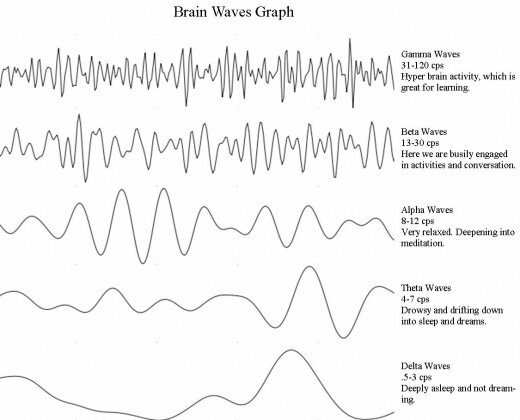 Delta brainwaves oscillate between .5 = 4hz, which refers to "Hertz", or "Cycles per second". For example, to illustrate the speed of a Delta brainwave, clap your hands 1 time every second - Count that. Snap one-thousand-one, Snap one-thousand-two, Snap one-thousand-three, and Snap one-thousand-four. That gives you about 1 cycle per second, or 1Hz. That's roughly the speed of a very slow Delta wave. Next, snap your finger 4x within 1 second. SNAP SNAP SNAP SNAP! That's much faster, and this is on the high-end of the Delta frequency spectrum - 4hz, or cycles per second. For EEG monitoring purposes, this represents the brainwaves from neurons that discharge at this rate - They transmit an electrical signal between 1 - 4 times per second, continuously throughout the day and night. If you are looking into free binaural beats or neurofeedback, you are probably interested in learning why you may want to modulate your Delta waves. The reason is simple: Delta waves should be prominent during specific stages of sleep, meditation, and relaxation, but they should not be present during waking states while you are engaged in alert problem solving behavior. Therefore, if you observe that you have a tough time with sleepiness, low energy, and drowsiness throughout the day . . . You may be producing an excess of Delta waves. Therefore, the quickest and simplest way in which to correct this problem is to make certain that one has sufficient sleep on a nightly basis and abstains from sedating pharmaceuticals. However, if these strategies do not suppress Delta brainwave activity during a waking state, one may prefer to train their Delta waves to behave in the most efficient manner. Therefore, neurofeedback may be utilized in order to modulate these brainwaves and enhance wakefulness, alertness, and engagement. Why Enhance Delta Waves with Free Binaural Beats or Neurofeedback? Delta waves are also important to produce in sufficient strength during sleep states and meditative states. Therefore, individuals who have a tough time falling to sleep and relaxing may exhibit suppressed Delta wave activity. Through training with neurofeedback, one may enhance Delta waves and train the brain to enter into a deeply relaxing state in order to promote healthy sleep cycles. This may also restore energy throughout the day, because Delta wave production is critical in order to immerse the brain in it's deep recuperation states. Free Binaural beats and neurofeedback may therefore promote energy through (A) suppressing excess Delta waves or (B) enhancing deficient Delta waves. Neurofeedback has been compared with brainwave entrainment / binaural beats, and these represent two completely unique approaches to influencing brainwave patterns. Neurofeedback involves the application of electrodes to the surface of the scalp in order to monitor real-time brainwave patterns, feed that information back to the user, and provide auditory and visual 'rewards' or 'signals' when one's brain is 'in the zone' of peak-performance. The neurofeedback software is pre-programmed with settings that inform the individual when their are in a 'positive' or 'beneficial' brainwave state vs. a non-regulated brainwave state, which interferes with brain function. The principle of brainwave entrainment has also been integrated into visual stimulation, where flashing strobe lights may be used to induce brainwave changes. However, strobe lights tend not to produce the musculoskeletal contractions evoked by auditory stimuli (music). Rather, flashing lights tend to evoke spontaneous imagery, because light stimulates the visual cortex. Therefore, some individuals have developed systematized brainwave entrainment systems, which do not represent drumming or conventional music. Rather, MIDI synthesizers are used in order to generate consistent pulsing sounds, which are designed to move the brain from slow to fast brainwave states depending upon the individual's objective. Slower pulsing frequencies may be utilized in order to slow and relax the central nervous system, and faster pulsing frequencies may be utilized in order to stimulate the nervous system and enhance energy levels. Brainwave entrainment may therefore me achieved through conventional means (Music and drumming) or synthetic means (modulated pulsing frequencies). Binaural beats may integrate systematized brainwave entrainment protocols through exposing individuals to fast auditory or visual frequencies in order to suppress Theta and Delta waves and boost Beta and Gamma waves. Conversely, some may prefer to reduce Beta and Gamma through stimulating individuals with slower binaural beat and visual frequencies, which slows and relaxes the central nervous system. This may be utilized to supplement neurofeedback training. Binaural beats or isochronic beats may serve as a brief intervention in conjunction with neurofeedback in order to evoke rapid changes in brainwave activity that are challenging to produce through training alone. This is also referred to as stimulation driven neurofeedback, which is discussed in another article. Neurofeedback in vs. Binaural Beats: Which is more effective? This question is relatively simple and straightforward – Neurofeedback is probably the most effective method for brain training, but these methodologies may also be integrated. However, we must first review the origin of neurofeedback, binaural beats, and the historical practice of integrating these systems. Neurofeedback is primarily focused upon measuring brainwave activity through an electroencephalograph (EEG) and serving that information to the user through computer software, which correlates changes in brainwave activity with changes in a visual, auditory, or kinesthetic stimulation. For example, an increase in Alpha brainwaves, which are associated with alert relaxation could be correlated with an increase in the brightness of an image on the computer screen, the increase in volume of an auditory stimulus via MP3 (i.e. binaural beats), or the vibration of a neurofeedback integrated chair. Neurofeedback is effective for informing individuals of their internal brain states so that they may learn how to modulate those states. Theoretically, this is more effective than training brain states without neurofeedback, because the computer accurately and immediately provides objective information related to the individual's brain state when compared with simple interior monitoring, unassisted by a neurofeedback system. Neurofeedback systems have also historically included the practice of stimulation-driven neurofeedback, which is designed to “drive” brainwaves through flashing lights and sounds that pulse at a particular frequency. For example, a computer screen could flash at 8-12 hz (Alpha), and an auditory stimulus could simultaneously pulse a frequency at 8-12 hz. 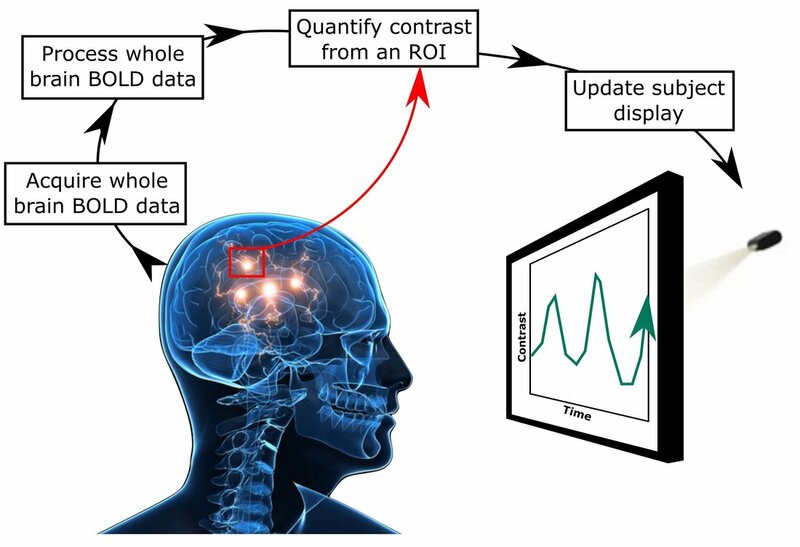 Through flashing lights integrated with isochronic beats (simple drumming effect) or binaural beats (frequency difference between left and right channels, which produces a phantom isochronic note in the auditory cortex), a computer's neurofeedback system could “drive” brainwave patterns to a specified frequency. This may be effective for assisting users with reaching the target brainwave states so as to guide users toward their target more quickly. Therefore, neurofeedback and binaural beats may be utilized simultaneously through stimulation driven neurofeedback. The question as to which methodology is more effective: Neurofeedback vs. binarual beats, should be fairly straightforward. Neurofeedback is a far more robust training system that is designed to train users to shift their brainwave patterns from one dominant frequency state to another, and light and binaural beat stimulation may be integrated into this process. Through integrating neurofeedback with isochronic or binaural beat stimulation, one may work with stimulation-driven neurofeedback. Binaural beats and isochronic beats may be utilized separately, but would most likely be significantly less effective than neurofeedback and neurofeedback + light and sound stimulation. Therefore, neurofeedback would serve as the primary method for training brainwave patterns and light and sound stimulation would be secondary. However, photic and auditory stimulation may also be utilized prior to applying neurofeedback protocols, because individuals may arrive at a neurofeedback training session with a strong dominant brainwave frequency, which could be challenging to change through neurofeedback alone. Therefore, the neurofeedback trainer may apply photic and binaural beat / isochronic stimulation prior to the session for 5 – 10 minutes in order to shift the brain from it's dominant frequency and allow for subsequent neurofeedback training, which could produce higher levels of efficacy. This method may be effective for maximizing the brain state plasticity immediately prior to engaging in neurofeedback training. This could be akin to “stretching” the brain prior to subjecting the brain to “exercise”. Therefore, neurofeedback and light and sound stimulation (isochronic or binaural beats) may be more effective than either methodology alone. Judith: Thank you. It's a pleasure to be here with you to discuss neurofeedback, binaural beats, and much more. Question: Okay. Great. 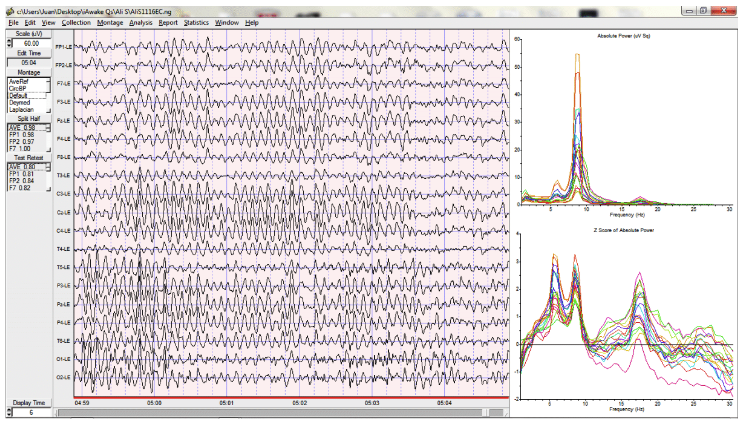 So we've got some neurofeedback slides lined up, and we've got some examples to show folks about how brainwaves work. But if you could, first, just tell us a little bit about yourself and the history of your neurofeedback work. Judith: Okay. Before this neurofeedback work I was a journalist and a 30-year freelance writer who, while writing a book about the awakening of my mind's consciousness, intuitively stumbled across the neurofeedback work of Anna Wise. I followed up on it, read her neurofeedback book, and realized that she had an absolutely pristine, crystal clear description in scientific terms of everything I had experienced subjectively. We started a dialogue on neurofeedback, and I went and trained with her at Esalen Institute in 2001. About five years later, in 2005, I began to get these very strong internal messages that I should go and study neurofeedback with her, and that's exactly what I did. I studied with Anna from 2005-'06, six different trips out to her home in Berkeley, California, and it was an amazing experience for me. I had this really deep and profound understanding of the subjective match between what it feels like to awaken and what it looks like on the Mind Mirror neurofeedback screen. She had me assist her for four years at the Esalen Institute, and she would go there three to four times a year and present neurofeedback workshops that were five and seven days in length. So I learned from the Mind Mirror neurofeedback master. When she passed away in 2010, nobody seemed to be stepping up to push the work forward. So I did, and I have been working for three years with a neurofeedback software engineering and EEG manufacturing company in England. Since that time we have produced a fabulous new Mind Mirror neurofeedback system. You're gonna see some of it during this program. This may be used as a more powerful next step once you have completed a standard binaural beat training program. Consequently, because we are now seeing much more in the neurofeedbck equipment, we have made some new discoveries. We have networked all of the existing awakened mind consciousness neurofeedback trainers in the world, through a website called InstituteForTheAwakenedMind.com. There is this incredibly strong surge in interest, worldwide, over EEG, neurofeedback, consciousness, meditation, and the brain. Therefore, more and more people come to us for neurofeedback training, and we're just absolutely fanning out all over the world. We have a new neurofeedback user manual and Max Cade's book has been translated into French, Spanish, German, and Russian. We having a fantastic time taking this neurofeedback work to the places that Cade and Wise would have wanted it to go and, certainly, hope that it would go. The sky seems to be the limit right now for the Mind Mirror neurofeedback. The person who started this neurofeedback work, C. Maxwell Cade, is shown in this picture below. Cade was a wonderful mix of scientist and mystic. He was a physicist by trade. He was also trained in medicine and a member of all of the Royal Societies in the UK, very highly respected for his contributions to the field of radar. He was watching the developments all over the world in neurofeedback, beginning in the 1950s really, and especially 1957 when Joe Kamiya discovered that someone could reproduce Alpha just by understanding the feeling of those brainwave frequencies in that category and train Alpha through neurofeedback. 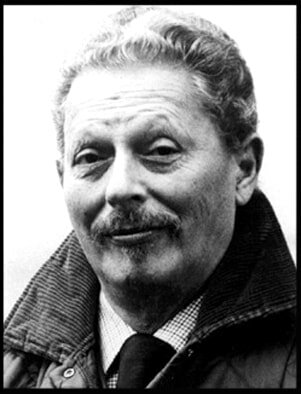 So Cade, being also a master hypnotist and a zen meditation master, had the bright idea that he could do the same thing that Abraham Maslow was doing in the United States, and that was to help people self actualize through neurofeedback rather than work with sick people. 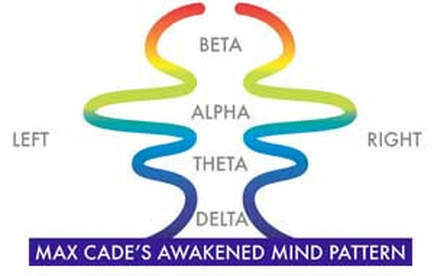 Cade wanted to utilize neurofeedback to map the patterns of consciousness in people who were having peak experiences and transcendent experiences. So Cade realized, even on these old Mind Mirror neurofeedback units that you have seen in the first image . . . You can see that they're hooked up to these little machines with headbands, under which are electrodes that are carrying these brain signals into the Mind Mirror. So these LED lights in the rows would light up, and they would form patterns. 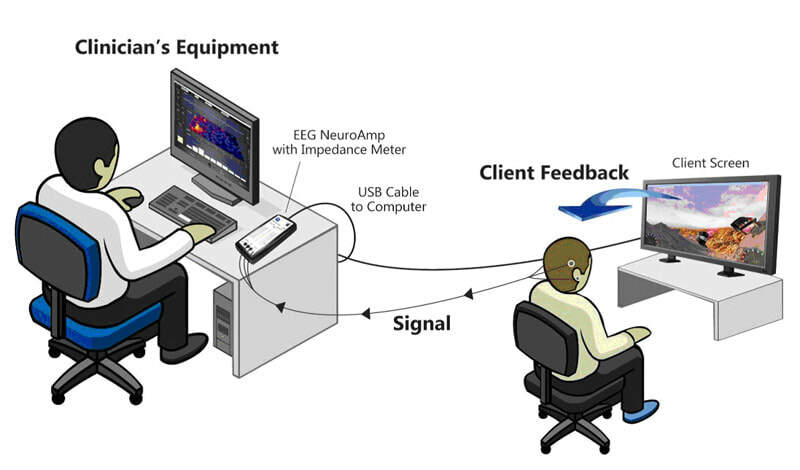 So also, I would just point out that there's another sensor on the neurofeedback unit, and that's called an ESR. It's a rectangular box inside of a black frame. Cade had been using the ESR since the early 1960s, in conjunction with the biofeedback expert at St. Bartholomew's Hospital in London, to track the physiological, that is the body arousal and excitation, that occurred just through a change in consciousness, just through a moment's stress, but also as the person would descend into meditation. This is recommended once you have completed a binaural beat audio training program, because neurofeedback will confer greater self-regulation capabilities upon users. These are four different colors and the nearness of the wave itself to the wave next to it tells about the frequency, up in red. The waves are very close together, very strong in amplitude. That's beta. The next category, where the waves are a little bit more spread out in the green-blue, that's alpha. Then the third one is theta, still lower and slower frequencies, thus, more spread between the waves. Then at the bottom is delta. These are the four primary brainwave categories that we train through neurofeedback, although we are also looking at, and we'll show you some gamma. My position is that "Brainwaves are the electrical activity of the mind." From a neurofeedback perspective this is about the movement of thought through the brain. Since thoughts and emotions follow precisely the same electrical pathways or neural circuits, we're really looking at consciousness. We're not saying that the brain generates consciousness. In fact, I think most everyone at this day and age, where we're talking about the quantum field and the bio-photonic field of energy that surrounds the body, I think we could probably agree that consciousness is bigger than the brain, but we certainly are seeing that the brain is the repository of consciousness that we are able to monitor and train through neurofeedback. On this Mind Mirror neurofeedback system, we are able to monitor it to a very extraordinary extent that I'm just thrilled to be able to show you in the slideshow. C. Maxwell Cade was using and we still today are using, both of these neurofeedback and biofeedback instruments together, because he has correlated the readings, and it proved dead-on true, even with the modern neurofeedback technology. So seated at this table, he has a group of people who are learning through, at that time, hypnosis techniques. Now we have less intrusive meditation techniques. Hypnosis has got a lot of talking involved. We are very succinct in our instructions as meditation guides. But nevertheless, it's the same technique. 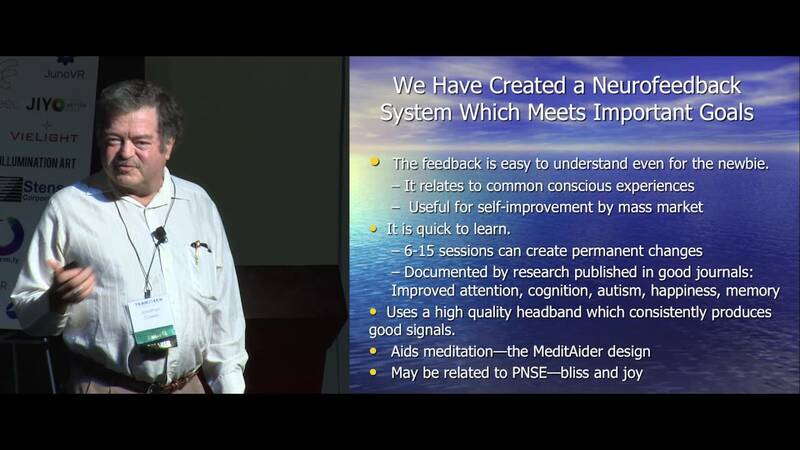 It's the same effects on consciousness, and he was guiding people down into meditation in these classes and, thereby, did 3000 case studies with this neurofeedback system. Now this language says, "From our studies of the brainwave patterns of some 3000 pupils, as well as swamis, yogis, zen masters, healers, mediums, and clairvoyants, it has become possible to establish that all of the unusual abilities that some people are able to manifest, self-control of pain and healing, healing of others, telepathy, et cetera, are associated with changes in the EEG pattern toward a more bilaterally symmetrical and integrated form." It was actually more than that. First, people need to be bilaterally . . . That means that, on the left side of the central channel, you see the left hemisphere of the brain. On the right side, you see the right hemisphere of the brain. So certainly symmetry matters in the development of consciousness and the ability to meditate, but there's another factor involved that is really the key to our work. 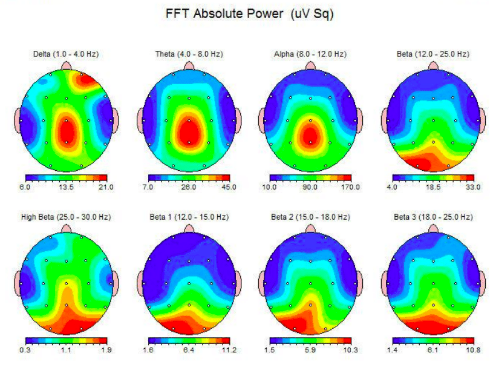 So let me just explain that what you're seeing at the top, where that the neurofeedback monitor says "38 Hertz," which actually covers the very fast beta speed of 38 Hertz to 44 Hertz, where you see these red, orange, and yellow, those are all beta. 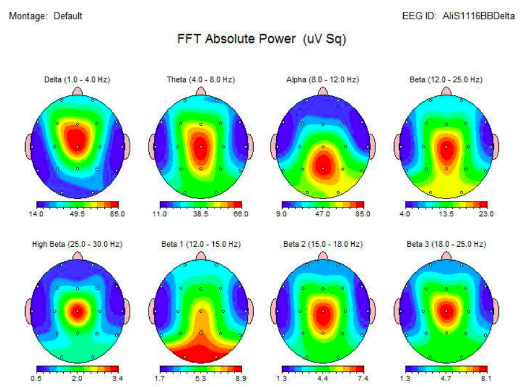 At 12.5, 10,5, and 9, in the green, you see alpha for neurofeedback. Blue is theta for neurofeedback, and the purple is delta for neurofeedback. Yes, certainly, bilaterally symmetrical, but integrated is the key, in that what we want to have happen and what we're utilizing neurofeedback to guide people toward is . . . Enjoying the firing of all four of these categories, simultaneously, and in the proportions shown here, so that you have the alpha and theta at a specific proportion, which allows for the key to the awakened mind. That is an open flow of consciousness from the conscious mind in beta, across the alpha bridge, and into the subconscious theta in the blue and the unconscious delta. Most people, and you're gonna see this a little later in the show, do not have brainwaves this good. If you would now bring in your little capsule that shows the moving brainwaves, we'll show you the brainwaves of somebody who is really good. 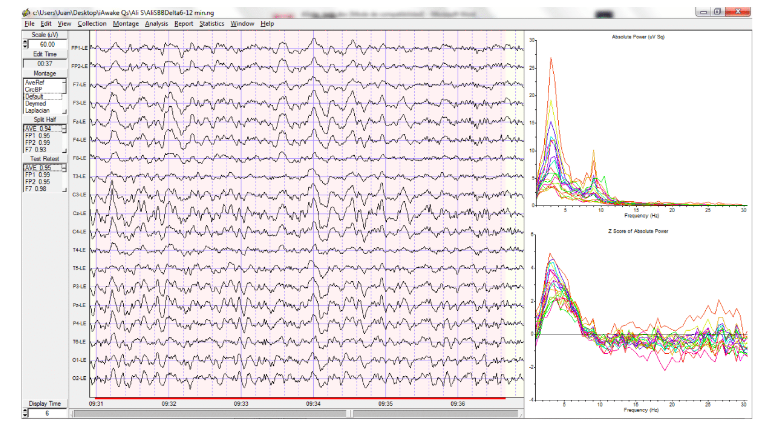 These are the brainwaves, and his permission to say so, of a man named Ahmet Koli [SP] in India. Now we see this awakened mind neurofeedback pattern with a nice big amount of theta in the blue, and sometimes the theta, the alpha and the theta conjoin, so that the pattern starts becoming a little rounded, which is a higher state of consciousness, the one that we are developing toward through neurofeedback (See video). So definitely bilaterally balanced and symmetrical and definitely integrated, which means that this person, Ahmet, by virtue of being a counselor and a very spiritual person who meditates quite a lot . . . He lives in the New Delhi area. He has got a . . . You could call it creative flow. You could call it peak performance. But in someone who has this brainwave pattern and utilizes it for self-discovery, healing, transformation, and consciousness evolution, then that person is moving toward self-actualization, essentially, what Maslow calls self-actualization, and also transcendence, which is a more rounded brainwave pattern that we'll also show you in a few moments. This may also be trained through neurofeedback. Through putting the EEG electrodes on the heads of these swamis and yogis, meditation masters, highly creative people, essentially everyone Cade mapped was highly developed and/or spiritually conscious. What he found in every single neurofeedback case was that when the person had their eyes closed and dropped into whatever their meditative or contemplative practice was, this is the brainwave pattern that showed up. He called it the "Meditative Mind", because it certainly is - This may be trained through neurofeedback. It consists of the four neurofeedback brainwave categories of beta, alpha, theta, and delta, but you can see that in beta here, in the conscious mind of beta, there's no activity. That's because it's meditation. You don't want the thinking mind to be talking while you're meditating or training in neurofeedback in the District of Columbia. So just to explain these neurofeedback and brainwave categories in better detail now, beta is the active mind of externalized awareness. It's logical, reasoning, intellect. It's the thinking mind. So you're listening with your beta right now. If I started to talk really fast and you had to speed up your beta, it would show higher frequencies and higher amplitudes of beta on the neurofeedback system - Amplitude being that which extends from the center channel to the left and from the center channel to the right. So you can see that there's more amplitude of alpha on the neurofeedback system than anything else there, where it says "bridge." That is typically the case because . . . Alpha is associated with our sensory awareness. Beta is verbal. Alpha is sensory. It is a relaxed, detached, and daydreaming mind. If you've ever sat in a classroom as a child and looked out the window and sort of zoned out as you watched the squirrels scampering across the limb of a tree, then you know what it feels like to be in alpha. That really is, to a great extent, the key to awakened mind consciousness neurofeedback training in. The concept that you have a landmark and a memory of what it feels like to be in alpha, the moment you bring that landmark back into your awareness, and you start to relive it with your senses, then your brain re-configures itself to the brainwave pattern that you had at the time of the original experience. Neurofeedback makes this observable. So you can revisit an original experience if it was a really good one. Now a lot of us, of course, are revisiting not such great experiences. Well, consciousness and neurofeedback training is about teaching you to be self-aware enough, so that you will begin to relive the really good experiences. We've all had them in alpha, whether you're walking in nature, digging in a garden, swimming in the sea, whatever has enlivened your senses. The beauty of is that it's not just enlivening your alpha amplitudes to do these things in nature or in the landscape of your mind, with your eyes closed during a guided meditation and neurofeedback. It's not just that you're enjoying and producing alpha. It's that you're also reducing beta. Because when you drop into alpha, your beta reduces as well. Once you have that alpha bridge to the deeper mind of theta and delta on the neurofeedback system, the deeper you go into theta, the more the beta reduces. So this person is centered in the alpha/theta definition of meditation. Meditation does not have to have delta, but it certainly has to have theta, because theta, as the home of our long-term memories, is also the place where we naturally enough would have our personal insights. It's that repository from which our creativity springs up. Our intuition is also associated with, well, comes out of theta, and this is where we have our spiritual experiences with neurofeedback. We become aware of ourselves as more than these five sensory, skin-deep or skin-enclosed separate beings in the world. That, one could call the core self. Anna Wise called it the essential being during her neurofeedback trainings. Some people would call it the soul. It's the idea that there is a wellspring of wisdom within us, stored right there alongside of our issues that have been conditioned into theta. You know the situation where, "My dog died when I was nine years old. My mom bought me a kitty cat, but when I was 10, the kitty cat ran away. So nobody loves me." So those kinds of conditioned beliefs and patterns of consciousness, those would reside in theta. Also residing in theta is the ability to clean them up with the creative wisdom that has much, much higher and wider perspectives through neurofeedback. We can also get our insights from delta neurofeedback in through the personal unconscious. Delta is our instinctual radar. We have had delta since we had nothing but the reptilian mind, back in our caveman days. This is the sense that we have when we are being stared at or when someone walks into the room, and their vibrations are upsetting to us, or when we try to take a step out onto the street, and a car suddenly comes out, and you don't see it, but something in you knows to jump back out of the way. That delta radar extends to different levels in people. Self-absorbed people have almost no radar. Normal people have about the radar that you see here, the amplitude of delta that you see here. People who are psychics and healers will have much, much, much higher amplitudes of delta going out. This is about a three or five micro-volt amplitude pattern here on the neurofeedback system. We have seen healers with 100 micro-volts of delta on the neurofeedback monitor, because they're actually extending their own consciousness field very far beyond themselves and encompassing someone else within it. Sadly, this is where a lot of people say, "Oh, I tried to meditate, but my mind was racing, and I didn't know what to do about it. I tried watching my thoughts, and my thoughts just ran faster." Well, nobody needs to suffer through that when utilizing neurofeedback. If you understand the basic principles that we're showing you here, then you can easily see that you drop into your sensory awareness through neurofeedback. Your thoughts slow. That can happen simply by . . . I'll give away a big trade secret here, but we actually got it from the yogis. So it's not ours in the first place. Relaxing the back of your tongue, that will reduce your beta waves during neurofeedback. Keeping your awareness focused on the back of your tongue will relax your mind, which helps to relax your body. You need both to be relaxed to go into a deep meditation. Arousing your sensory awareness during neurofeedback by going to a beautiful place in nature and living that with your senses, and then sitting down in someplace in that environment and feeling yourself drop deeper down inside yourself, down and in, down and in, deeper and deeper inside. Just that simple. That's how you calm the racing mind and move into a really great neurofeedback-supplemented meditation. The more you do that, the more likely and the faster you will be able to develop what our next slide shows, and that's the awakened mind pattern, which is identical to the meditative mind, except for one thing, and that's that you see some low amplitude in the beta, very low amplitude in the highest frequencies of beta, more amplitude in the mid-beta frequencies, which, in this pattern, are doing self-awareness work, self-discovery, healing, or transformation work, and being present to the meditation to do creative problem-solving. So what this says is that spiritual masters, long-time meditators, and people with a high-performance mind, as Anna Wise called it, emit light and the frequencies composing this brainwave biofeedback pattern, as with meditation pattern, characterized by an open flow of clarity, creativity, insight, spiritual connection, and psychic awareness. So Cade called this neurofeedback brainwave pattern lucid awareness at first, because there is an enormous amount of mental clarity. The thinking mind, up in beta, which is where the repository of the ego, upon discovering the rich resources in its theta essential being, suddenly says, "Oh, I'm not alone," and it quiets down very quickly to be able to draw those creative solutions up. It doesn't matter if it's a work project or a relationship. Whatever you don't have an answer to lies down there in theta neurofeedback range. I, myself, have done thousands of neurofeedback sessions and taught many more thousands of people in large groups. Everyone can meditate independently and through neurofeedback. Everyone can get their answers, and everyone, especially . . . I see this when people are hooked up to the Mind Mirror neurofeedback system, over either a weekend or five-day training session. They make the most extraordinary advances in consciousness through neurofeedback training. You end a neurofeedback meditation with certain brainwave pattern. You start the next meditation the next day with the same brainwave pattern, because what this is about is conditioning. You are taking your brain to the place where it is able to have an optimal awareness and optimal functioning through neurofeedback. The brain says, "Oh. Well, this is where I was when I was a child, or this is where I was when I had my big a-ha experience," or, "Oh, this is where I am when I'm in the zone." So the brain, loving to function as beautifully as it can, then proceeds to continue to condition this pattern through additional neurofeedback. Once it does, because it is a peak performance pattern, then there are flashes of what we're gonna show you in the next neurofeedback pattern. A lot of people talk about this phenomenon of cosmic consciousness, spiritual illumination, and transcendence during neurofeedback and otherwise. The experience is 1000% real. People who are on the Mind Mirror neurofeedback system will flare into that awakened mind pattern, get an answer to a long-standing problem, and be filled with so much gratitude. What are actually separations in the mind, beta from alpha, alpha from theta, theta from delta - All those separations disappear during our neurofeedback training. One begins within one's own mind to resonate in harmony and in unity inside. When you do that, then suddenly you find that the blocks that were keeping you from resonating with universal God, Mind, Love, Peace, Awareness, whatever you want to call it, those roadblocks are gone once the neurofeedback sessions are complete. So people who have the evolved mind neurofeedback pattern, whether in partial evolved mind patterns that aren't perfect circles, but close to, with some rounding of the pattern, those people are experiencing something greater than themselves. They come back changed, affected in profound ways by the realization that everything is just one. It's just one mind, one energy, and we have access to everything we need or want to know or experience. In this pattern, what was unconscious and not known or understood before has become known and understood. This is Richard Buck's spontaneous illumination, would look like this or one of the other two neurofeedback patterns I'm gonna show you in a minute. This is if you . . . For example, Maslow talks about this, about the woman who is in her kitchen, and she's grating carrots, and she hears her husband and children in the next room laughing. All of a sudden, she has this incredible sense that all is right in her world, that everything is perfect just as it is, that it was always meant to be this way. She begins to cry tears of bliss. That would be a flare of a partial or a full evolved mind neurofeedback pattern. Everybody who ever feels this just wants to have it again, because it's what we were meant to experience. If you'll flip to the next slide, I'll talk about this a little bit more in light of modern science. So the Villistus Mind Mirror 6 neurofeedback system has given us two extra bands. You see here an awakened mind pattern and, above it, kind of the bottom, what I think, and we'll never know the answer to, what I think is the bottom of an evolved mind pattern. Whether it is or not, in the two neurofeedback bands that we've added to the Mind Mirror 6, we're looking now at 44 to 54 and then 54 to 64 Hertz. Those involve gamma brainwaves. I have seen a lot of interactions between the evolved mind pattern and gamma, which makes absolute and total good sense. But suffice it to say that, in terms of where neuro-science has been and possibly is still going, it's certainly where all Mind Mirror neurofeedback research is going, is toward a more full understanding and neurofeedback training of these gamma brainwaves. Because just as the evolved mind is a whole body, whole mind, whole spirit unification and integration, the production of gamma waves causes extraordinary things to happen in the brain, consciousness, and body. First of all, gamma, other than theta, only gamma is able to form new brain cells that give us more capacity for creativity and intellect. Also, gamma rewires, through neuroplasticity, brain circuitry. So I know of at least one doctor right now with an alternative practice, who is training veterans with PTSD, because you rewire those circuits that are way down there in the unconscious mind very fast with gamma, partly because gamma and delta are related. But also, gamma, according to neuroscientists, Will Singer and Richard Davidson, both of which . . . both of whom have done a lot of studies with the Mind and Life Institute, which operates under the . . . with the permission and help of the Dalai Lama of Tibet, gamma . . . What they've found is that with gamma . . . Can you see my picture here on the screen, also? Just imagine on your own head, is that above your ears or your temporal lobes. In the back of your head are the occipital lobes. On the top of the head, where you would call your crown, are the parietals. On the very front of your head are the frontal lobes. So when gamma is active, and these being faster frequencies than beta, which the highest beta frequencies are stress, anxiety, and panic. Something happens in the brain when gamma is produced, and it's beyond the level of stress, anxiety, and panic. In fact, it's peaceful transcendence. All four of those regions, those lobes and regions of the brain, across frequencies, across the regions, integrate. Meaning that now you're operating with all of your pistons running at full speed. Now I know there's been a lot about, "Oh, we're using only 10% of our minds." Well, that's since been proved untrue by modern PET scans. We're actually using all our brains, but not necessarily, you see, at the same time. If you were standing and looking at a picture of a cameo broach or anything else, well, you're certainly using your visual cortex. Now when you start to think about that cameo broach, then you're using your frontal lobes. So it's true that sensory awareness can activate some kind of synchrony, but gamma synchrony means that everything is at top performance, forming new brain cells, rewiring circuits, and it's certainly something that we really want to look at. Neurofeedback may promote these brainwave patterns. This neurofeedback pattern, I have seen this. I call it the super-conscious mind. I've seen it on, actually, quite a few people by now. In fact, I have to . . . I think I'm gonna have to adjust the drawing of this neurofeedback pattern. How you see this, above the awakened mind, this bottom of the evolved mind circle splaying out to each side, that's how it looks when someone who has gamma goes into meditation. As they deepen into their theta, the gamma starts to synchronize with the beta, so that you have basically an awakened mind pattern with a lot more amplitude in gamma and beta. That's exactly what it looks like. People need to have gamma synchrony during neurofeedback because, first of all, that's the definition of having the lobes and frequencies integrated, but also because people who . . . There are a lot of them running around, I'll tell you. People who have this untrained gamma are nervous, excitable. They talk a lot. They drive everybody kind of crazy. I don't know if you know anybody like that. Super, super smart people. It's like they're downloading information all the time, but they don't know what to do with it, and they aren't necessarily connecting it to the rest of their integrated mind. But most of all, they are very sensitive to electricity and computers. So what I've found, over the past two years, is that when you synchronize this gamma during neurofeedback, so that it's operating in coordination and integration with the rest of the pattern, then you truly have a super-conscious person who is tuning in to the most amazing insights. Gamma is now associated with peaceful transcendence, mystical union, spiritual ecstasy, out-of-body experiences, super lucidity, hyper intuition. When it's integrated with the awakened mind pattern, and it can be done in meditation, and, like the awakened mind, the brain and consciousness can be . . . If they can be trained, and, of course, they can, to maintain the alpha, it can be externalized and generalized to the outside world. So just as the awakened mind can be externalized, even with the eyes open, this super-conscious pattern, and I've seen it, can be externalized with the eyes open. So these are people who are operating on the trans-personal level during neurofeedback training and otherwise. I'll tell you. The people who come and do the neurofeedback trainings these days and becoming awakened mind neurofeedback practitioners, a lot of them on that level. They are super-evolved people. So that is one new finding. If you go to the next slide, we'll look at the second. The second slide is the gamma brainwaves, and we'll see it in a minute, of universal consciousness. The universal mind is what we want. There it is. This pattern, I've actually only seen in two people, but it does exist. In both of them, the gamma was so . . . of such high amplitude and such magnitude and power, that it actually squashed the entire rest of the brainwave pattern down, so that it was . . . The gamma was actually taking up 64 Hertz down to about 20 Hertz. The two people I saw it in . . . One was a woman who was in a meditation inside of one of mine, called "The Inner Temple." Most people go into the inner temple. They open a door. They see the solutions to their work issues, their relationships, things like that. They see who they really want to be in life. But this woman, who turned out to be a very advanced natural psychic, which I didn't know beforehand, she walked into the temple and later told me that she met a hall full of angels who were talking to her and telling her things now. Angels, as I understand it, being patterns of energy. She produced this pattern. Then three days before that, two day . . . One day before that, I saw this exact same neurofeedback EEG pattern on a famous healer from England, who was working on me. He was hooked up to one Mind Mirror neurofeedback system, and I was hooked up to the other. I'm telling you. When I hit this neurofeedback pattern, I had golden streams of energy rolling into my body, and I was so filled with bliss. I kept thinking, "I've got to look down at my Mind Mirror to see what the pattern says," and thinking, "I don't care about the Mind Mirror." You know? So it's one of those experiences where it . . . In universal consciousness, it's the same thing as the evolved mind, except that what's coming through gamma are some very high-frequency waves that are connecting you to this universal consciousness. I sure hope to see it a lot more in the future, but no, I've only . . . So far, I've only seen it in two people. But the super-conscious pattern that we just looked at before, that one, truly, I have seen in a man who was a former opera singer, who is now doing networking communities of people all over the world, with some of the leaders in that field of consciousness and neurofeedback. I've seen it in a woman, a Russian woman in Australia, who has this incredible understanding of energy and, of course, is a Reiki healer and a long-term advanced meditator. I've seen it in one of our awakened mind newly certified practitioners, who's a singer, singing teacher, musician, world-class photographer. She produces a lot of gamma and has it synchronized, and she is . . . We're going great guns with her, with this work. She's just formed a meditation publication company, where she and I just . . . This is an aside, but it's kind of interesting information. It just tells you more of what Andrea Grow [SP] is like. She and I recorded 40 or 50 of Max Cade's and Anna Wise's unrecorded meditations in Bamberg, Germany a couple months ago. She is going to make those available to the world. They're just absolutely stunning. I'll tell you. Some of Max and Anna's neurofeedback meditations . . . Now we can see the brainwave patterns, but they certainly would evoke these meditation, at least in flares, if not in consistently held patterns. So you might ask, "Why does not everybody have these patterns? Or have I had these patterns?" Well, if you've had an a-ha experience where you felt like everything in you was switched on, with incredible insights, you certainly have had an awakened mind pattern with or without neurofeedback. But having an awakened mind pattern like this one is externalized with eyes open and is consistent and stable. That's another matter altogether. That does require brainwave training and the kind of training, as always, with awakened mind neurofeedback training, that helps you re-target and then remember the feeling of that state of consciousness. So you can re-invoke it on your own. So now, why don't we all have it? Well, here's why. Up at the top, you see a neurofeedback pattern called ordinary consciousness. Well, that ordinary mind has no alpha or theta. Delta is typically present because it's that radar-like empathy and psychic awareness. Let's say you're sitting in your meditation space, meditating, or maybe just doing some creative work. What can happen is that, if it's sensory work, if it's work that enlivens your sense of relaxation, then maybe, in category one, you're gonna have some flares of alpha. Category two . . . I'm sorry. Category zero is flares. Category one is gonna be intermittent but stronger. Now category two, as you start to deepen into theta, and you can see that theta flare, now the alpha starts to stabilize. These all have specific feelings. We're going to look at what those feelings are in a minute. In category three, your alpha is really starting to become continuous now. You can see that the beta has reduced. The theta is becoming more stable. Category four, an increased, still further increased theta, maybe theta is flaring in and out, as shown by those dotted lines, but still stable alpha, stable beta, reduced beta. Here, we are seeing some delta in this person. Now category four or five, that . . . Four is a meditation pattern. That, we would call an alpha/theta, stable alpha/theta during neurofeedback observations. The beta is no longer present, as we saw before. Alpha and theta are in proper proportion or ratio to each other in the rest of the pattern. Now, category five, that is the neurofeedback pattern that we just showed you, the awakened mind of creative flow and peak performance, hopefully working towards self-actualization. It's the same as a meditation pattern, except it's got a rounded-end beta. This would be characterized by strong intuitive insights into questions, issues, and challenges. Then category six, the evolved mind pattern. Oh, and let me just say here, because I didn't before. How do you get from the awakened mind to the evolved mind? Well, certainly in meditation. As I said, you can have a sudden excitement about a creative solution you've just received. Then that will typically cause alpha and theta or maybe beta and alpha or either delta, to flare out into higher amplitudes and, partially, or even wholly, unite. But it's also true, and this is . . . I just want to share this with you because most people don't really realize this, I think. If you are doing your creative work, and you flare into that or stabilize that awakened mind pattern, the amplitudes in that pattern make it very possible for you to be able to flare into an evolved mind pattern. This is possible either with or without neurofeedback, but neurofeedback may enhance skill acquisition. It literally is about the increase in the amplitudes and the unification of two or more of these categories. I'll tell you. What I have found to be the fastest way to flare from an awakened mind neurofeedback pattern into a partial or full evolved mind pattern is just to feel gratitude, to be aware that there's something greater than us, and that that is about healing and growth, and it's a benevolent force. Something in us, as Andrew Newberg knew . . . He said in his book "Why God Won't Go Away". We are absolutely built for this evolved mind pattern. There's something in us that affects our arousal and relaxation - With or without neurofeedback. The nervous system cancels them out, dissolves our . . . dissolves the definition of separation that is given to us by the parietal lobes up at the top of the head. When that dissolves, then we have this incredible sense of oneness with everything, and it's like we go into this primordial awareness that some call pure spirit and others call pure mind. You can take the . . . If the spirituality is too woo-woo for you, you can just say, "Okay. The quantum field of light," because this pattern is about light, you see. It's about the amplification of the photons of light that are traveling through the brain and body during neurofeedback. So you don't actually have to meditate to flare during neurofeedback, to have a spontaneous illumination, as all of the studies and books out today will tell you. It can just happen for no reason at all. Anna Wise said that this was an act of grace. Then you've seen our seventh and sixth and seventh patterns of . . . I've just lumped them because of something we're gonna see in a minute. I've called them both category six because, truly, the descriptors of category six work perfectly well for the super-conscious mind and the universal consciousness mind, where gamma frequencies are involved during neurofeedback. Super-lucidity, powerful revelations, revitalizing, we're calling it kundalini energy. You can just call it nervous system energy if you prefer to utilize neurofeedback-related terminology. Neuro-genesis, neuro-plasticity. It's a charge. You're just literally charged up. Same with the eighth state of consciousness and category six neurofeedback patterns. These states are well-known to all scholars and meditation state, if I can . . . See if I can recite them properly. State zero would be deep, dreamless sleep. One would be REM or dreaming sleep. Two would be awake. Yeah, and four would be meditation. So five is the awakened mind. Six is these higher or more expanded states of consciousness. This is something I'm delighted to show you. Normally only awakened mind neurofeedback trainers will have this, but I put it up on the website because we're all heartful, spirited people who want everybody to . . . Even people who live out in the boonies and can't afford to move forward with their meditation patterns, just with this information you have right here, this should be enough to help you begin to master your mind. If you look at this table of subjective landmarks over in the left column, those numbers are gonna go, and you'll see in a minute, from zero to six. State zero, that brainwave pattern we saw earlier, with no alpha and theta, only beta and delta, this is experienced according to Terry Lesh [SP], researcher who worked many meditators and got subjective descriptions from them of what it feels like to descend into meditation. They would always start out maybe having some difficulty stilling the mind or the mind racing out of control, itchy, distract-able, inattentive state. If you've had trouble meditating before, then you always know all these descriptors. Why am I doing this? But then, suddenly, maybe they're just beginning to relax and just starting to settle down. That's alpha coming in over on the right column, where it says, "Possibly intermittent alpha." State one can be some of the sensations of alpha during neurofeedback. I've never had any of these, and very few people do, but some have. So you can say that alpha coming in might feel like a foggy state or dizzy or sensation of going under an anesthetic, could even be a feeling of nausea. You know? If you have been really living in your beta your whole life and have never descended into yourself, it might be a bit of a jolt. But if you just stick with it and observe it and allow your mind to be filled with every day affairs, then soon, that feeling of scattered energy is going to either feel like you're drifting off into sleep, as that alpha strengthens and takes you into state two, or your scattered energies are going to begin to collect. As the theta comes in during neurofeedback, you may well have childhood flashbacks because that's where those memories are stored. Because now you've got alpha and the beginnings, at least, of theta, intermittent theta, you may begin to feel calm and relaxed, maybe uninvited flashes of imagery, images from the distant to the immediate past. Maybe your attention is still not very sustained because your alpha could be continuous, but might not be. Your theta might not be continuous either. But if you stick with it, then you'll find yourself in a transitional state, where once more theta comes, then now you'll have a greater sense of stability, well-defined state. Maybe bodily sensations of floating lightness, swaying, or rocking, which in my experience are not real, nor is that rhythmical movement. It's just that you become so quiet during neurofeedback. You're becoming aware of that your heart, the movement of your blood through your blood is so strong, that on the inside, you feel like there's movement. I've actually opened my eyes, and there's no real movement. It's just a sensation. Now that's not true of yoga people, who are going into asana [SP] postures and stuff like that. But for most people, it is a slight rhythmical movement. Now concentration easier and stronger, increased and clearer imagery and increased ability to follow guided imagery. Now four here is where you start moving into a meditation state during neurofeedback, and this is what . . . This is a terrific explanation of the beginnings of a deep meditation state, where there's an extremely vivid awareness of breathing, heartbeat, blood flow, or other bodily sensations, which gives way, and I've had lots of meditation students, like in community college classes, feel the loss of body boundaries and get scared and just jump back up out of meditation. But actually, the loss of body boundaries is where you're coming into the awareness of your pure mind. So you actually want to lose the sensation of numbness in your limbs or growing to a great size, heaviness or lightness. When all of that passes, then you're settling down into a continuous alpha and theta of either number five, the mass meditation practice or an awakened mind. This is a very lucid state of awareness, consciousness, feeling of deep satisfaction, intense alertness, calmness, and detachment, a sensation of spacing out or disappearing, as we said, from the environment and/or the body, extremely vivid imagery when desired in, because we're problem-solvers. We want to go from that awakened mind to that evolved mind pattern during neurofeedback training. That's how those categories amplify. We want to solve those problems, get more and more inner unity with ourselves and others and our spirit. We want that vivid imagery. So we want to get to the state, low four or a full state five, to be able to get that imagery. A feeling of an altered state. You know the difference. I had somebody the other day, and she only did two meditations, and she could tell it. She used this very same scale, and she did a . . . had a three or a four on the table of subjective landmarks for an alpha/theta meditation. But when she dropped into the house of doors meditation, a theta neurofeedback meditation, she absolutely felt the difference. Everyone does, because in a five, there is a sensation of a peak experience, an a-ha moment, an intuitive insight. You know that that's your high-performance mind. Now when you shift from that high-performance mind into the amplification of any of those four categories or all of those four categories, into a state six, you will . . . It could still be an awakened mind pattern, but you're gonna start to see some rounding of the pattern into that evolved mind circle, because this is markedly different in your experiences. It's a new way of feeling. You're gonna have an intuitive insight into old problems, as though seen from a more aware level, literally a higher perspective. There's an inner certainty that comes, that's built into that explanation, where you absolutely know that's the truth. It may be that you've experienced a synthesis of opposites into a higher union. A lot of people report a sensation of being surrounded in light during neurofeedback - A feeling of higher spiritual awareness. As with my inability to look down at the Mind Mirror neurofeedback system while the healer was working on me, a sensation that nothing else matters, other than just being, I did actually open my eyes, but it took the most incredible amount of will to do it, because I was experiencing bliss and undefinable peace and a greater knowledge of the universe. So you can see how the super conscious mind and the universe of consciousness with the gamma, they still fit into this. These are the highest-known experiences. At some point, we may add something. Some people suggested . . . One person suggested that you could say . . . Make a state seven that says emptiness or pure spirit, pure mind. But in actuality, I think that six, what's there in six, perfectly describes that right now. Yeah. So that's basically what we do, is help . . . is use the EEG neurofeedback system to watch those brainwaves, make sure that the beta is reduced, the alpha is steady and stable, the person is in their theta so they can reach those intuitive insights, solve those problems, and understand that that power lies within them. You don't have to go to a hypnotist or a psychic or a priest or politician or parent to get your answers. It's all right there inside you. If there's any one thing that I want to convey in this program, that's it, is that once we understand how to quiet the mind and move into a deeper level of consciousness during neurofeedback - , everything is within our grasp. Not just everything within us - Everything that is resonating with universal mind and is especially picked up down there in our delta, in those low, slow brainwaves that are like a smooth glassy lake. There's no interference. That's where your intuition comes in and a greater knowledge of the universe. So that's basically it. Folks, if you want to learn more about Judith Pennington's work about the Mind Mirror neurofeedback practitioner training that she provides, and if you wanted to purchase your own EEG device and study yourself or work with folks, you can click the link below to check out the Institute for the Awakened Mind. Judy, thank you again so much for joining us. It's been a real pleasure and, I think, very educational for a lot of folks who may not be familiar with brainwaves or already are and want to learn more about this very unique work that you're doing. Parents and children may be interested in binaural beats, because they are designed to promote relaxation and self-awareness. Parenting is a tough job and your kids will test your patience, the rules, and the boundaries you set, so binaural beats may serve to supplement self-care strategies for you and your children. Parenting is a full-time job, so utilizing free binaural beats during your personal time may be valuable for training your central nervous system to be relaxed and aware. This is because if you are a parent, you recognize that you must be aware of everything your child is doing. Protective? : As a parent, you want to wrap a cocoon round your children and keep them safe forever, but this is an extreme. Keeping your child safe from harm everyday is impossible. However, you can learn to be a protective parent and balance your central nervous system and vigilance through binaural beat audio programs that promote relaxation. Binaural beat audio programs may assist parents with relaxing but remaining alert as they monitor their children. Persistence: Kids can be very persistent in wanting to get away with things or having their way, but you need to be persistent as well. As a parent, you need to set ground rules, and part of being a proactive parent is being a persistent parent. Your child needs to know that rules are not meant to be broken and getting their way all the time is not going to happen. You don't have to be harsh on your child to be persistent. Grounding and taking their things away shows you mean what you say. If you show you mean business, then you are proactively parenting. However, some parents become apprehensive when they consider these forms of punitive discipline, so incorporating binaural beat audio programs into your parenting strategy may be effective. Rather than simply grounding your child, provide your child with some free binaural beat audio programs for 20-min while they learn to self-regulate their emotions and behaviors. This may be very effective when you and your child need to take time to relax and calm your central nervous systems separately or together. Kids are on the go eighty percent of the day, and it can be difficult to keep up with an active child. Binaural beat audio programs may be effective at promoting relaxation and slowing your child down. However, for those days when you want to "be all you can be", you need to be attentive and accessible. Kids like to stay busy and on the go and it is your job to keep up. Therefore, binaural beats that are designed to stimulate you and promote wakefulness may be of benefit if they have demonstrated efficacy. These may include the binaural beat audio programs that are focused upon promoting gamma brainwaves. Attentiveness: Your child wants your undivided attention, and although they have friends, school, and after-school activities, they want a parent who is involved in these activities. Therefore, incorporating activities that you both need (relaxation and self-awareness) may be enhanced through incorporating a binaural beat audio program into your parenting strategy. Sit with your child and practice mindfulness while you both 'tune in' to a free binaural audio program. Accessibility: Parenting is being there for your child, and kids need to feel loved and wanted. Make yourself accessible to your child by showing an interest in what they do and how they feel. If your child is not fully aware of how they feel, you could introduce them to a free binaural audio program, which could guide them through emotional self-awareness practices in a calm and gentle manner. Make yourself accessible in a way that would promote your mutual wellbeing rather than burning yourself out. Some days it will be difficult to reason with your child, and one of a parent’s jobs is to be reasonable when a child is difficult. There will be days when you have to referee and days when you have to regulate, so be prepared to do both when your child gets in trouble. Through incorporating freely available binaural audio programs, parents and children may learn to self-regulate their psychological state so that your day proceeds more smoothly. Referee: There will be days when you have to be a referee, and your child is going to be defiant and probably get into arguments with you or someone else. When this happens you have a be a reasonable parent, which includes knowing when to step in and integrate binaural beats as a component of training your child to self-monitor and self-regulate. Regulate: Trying to regulate what your child through linguistic commands alone is like trying to stop a speeding train – seemingly impossible. However, you can, within reason, regulate their actions through providing them with a clear time and location where they can listen to binaural beats and learn to self-regulate their state. When is the last time you ask your child how their day was? Let's face it, most of the time parents are too busy to engage their child in a conversation. Of course, life does not always revolve around your child, but you still have to listen to and communicate with your child in order to ensure that they utilize their binaural beat MP3 audio programs properly. Encouragement: A good parent encourages their child in everything, and that may include training them to listen to train in relaxation through listening to binaural beats. You child may resist, avoid, or embrace these tools, but it is how you handle the situation that will make a difference in your child's life. Do not scold your child for making a mistake or failing to complete a full binaural beat session. Praise them for listening to the portions they completed, and move on to your next activity. Enthusiasm: Enthusiasm is contagious, so leverage this while you encourage your children to complete their free binaural beat audio sessions. Go to the park or library for a day of adventure, and conclude with a relaxing drive home with binaural beats playing in their music device. It doesn't matter what kind of day you had, just make sure your child has the opportunity to relax and decompress after a day of activity. Parenting is a never-ending job - From the time your child is born to the time you die, you never stop being a full-time parent. Therefore, you must integrate nourishing and nurturing activities into your daily parenting routine. Binaural audio programs may assist with this, because you, your child, and your family can join together and practice self-awareness with a binaural training program. There must be times for nourishment and relaxation. Nourishing: As a parent, you want your child to have everything - You make sure they have food, clothing, and shelter. You give them nourishment so they can grow into healthy adults. However, they must also learn how to nourish themselves, and binaural beat audio programs may accomplish this through providing them with a means to self-regulate and relax during their personal, interior challenges. Nurturance: You wipe away a tear or kiss a boo-boo when your child gets hurt, but when they are grown, it is not always easy to fix everything. As your child gets older, you have to understand you cannot fix everything. Part of never-ending parenting is wanting to fix all of your child's hurt and knowing you can't. You have to learn it's okay to let go and let them learn so they can grow, but it's also okay to be there when they fall. Therefore, children who are provided with access to binaural beats may find that they are able to nurture themselves through reaching for a healthy strategy to promote the relaxation and regulation of their central nervous systems. It takes a team to raise a child. Whether it is your partner, a teacher, or a friend, it takes teamwork. Raising a child from an infant into an adult is stressful and at times heartbreaking. If you are a single parent, then you need all the help you can get. If you are part of a two-parent home or blended family, you still need all the help you can get, and free binaural beats can provide you with the means to come together as a group and listen to these audio stimulation tools. Togetherness: Raising a child takes more than one person, it takes a team. That parenting team must stick together. If there are different set of rules or different discipline methods, then your child will be defiant. There is strength in numbers and there is also strength in parenting a child together. Therefore, if you choose to utilize binaural beats with your children, make certain that all members of the family understand and agree on the best methods for incorporating this into the family self-regulation process. Truthfulness: Parenting cannot be based on lies. Parents are part of a team and of one of the team members isn't truthful, then the team fails. You have to think of team parenting as a sport. When one player doesn't do their part, then the team loses, so truthfulness is a major play in the game of parenting. Even white lies and fibs turn into something that gets out of hand, so you must lay out the groundwork before you start team parenting. Develop a strategy for utilizing free binaural beat audio programs with your family, and report on your progress with these programs honestly. Your job as a parent will be filled with joy, sorrow, and pain, but you can be a great parent and win the parenting game if you follow six life lessons. Always be proactive, stay active, be reasonable, stay engaging, never stop being a parent, and create a winning parenting team.